Offers long lasting screen protection. 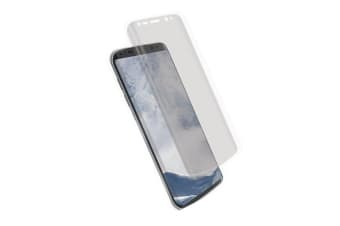 The Cygnett FlexCurve 3D PET Screen Protector for Galaxy S9 Plus offers long lasting screen protection against damage due to an everyday accidental fall or daily use impact from items such as keys and coins. With added protection from fingerprints, water as well as smudges, the Cygnett FlexCurve 3D PET Screen Protector for Galaxy S9 Plus offers optimal clarity and protection for your phone and its precise laser cut process ensures a curved fit for your device along with a bubble free easy application ensuring it will go on your phone’s screen easily. The PET fibres offer optimal long lasting protection from daily use impact, along with 4 layers of technology. It will also protect your phone from scratches and damage as well as having a rounded edge ensuring your phone is highly protected. The FlexCurve delivers real security in screen toughness and protection avoiding damage whilst being protected from the elements that are around you. Installation is almost fool proof. The FlexCurve connects seamlessly to your device’s screen providing you with a great connection.